Centre for Information Management | Disillusioned with Big Data technologies? – DON’T PANIC! Disillusioned with Big Data technologies? – DON’T PANIC! 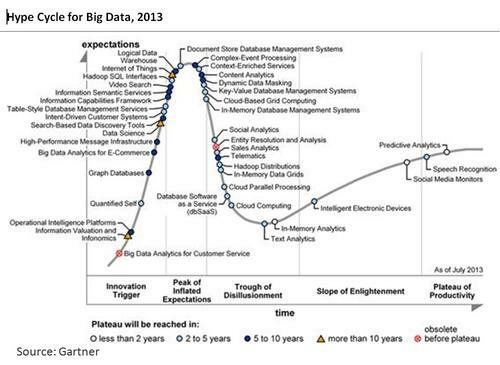 Late last month, Gartner announced that Big Data had met the trough of disillusionment. This is the third phase in Gartner’s hype cycle and indicates the moment when everyone pauses for breath and starts to look rather more critically at what Big Data technologies are actually delivering to their business. InformationWeek report that cloud computing and celebrated in-memory databases(such as SAP’s Hana and Oracle’s Big Data Appliance) have been seen as cost-saving approaches to managing Big Data, but that organisations are beginning to question the actual level of savings being made. Gartner’s Nick Heudecker believes that this lack of saving is resulting in a pullback on expenditure. But haven’t we been here before? Remember CRM systems? They’re still extremely popular and are currently extending into the same cloud and in-memory technologies as Big Data. In fact, there are similar claims to the benefits of Big Data analytics as there were when customer insight analytics were seen as the latest business breakthrough. The technologies promised new opportunities to upsell to customers, improve customer relationships and generally save costs. However, while some companies achieved the full benefits from their CRM projects, many struggled. CRM projects fail because of focusing too much on the technology without an equal focus on business strategy. So for CRM, it was not about the new technology, but about business and organizations using CRM analytics to start thinking differently about the way they interacted with their customers and adjusting their business strategies accordingly. Some companies got that, others didn’t. ‘Of Life, the Universe and Everything…’ said Deep Thought. And that is the crux of the challenge for Big Data analytics. Hana and BDA have fixed the problem of the 7 ½ million years’ lead-time, but we still have to figure out the right questions to ask. Speaking at the recent launch of the Centre for Information Management at Loughborough University, Professor Robert Galliers suggested a possible way forward: “Why the continued dissatisfaction in those [Big Data] technologies? [Because] management [fails] to figure out how to use the information it generates to make better decisions or gain deeper, perhaps unanticipated, insights … We should turn those data into questions, based on our existing knowledge, to question that knowledge and to come up with new insights”. What’s up to every , since I am truly keen of reading this webpage’s post to be updated regularly. These are actally enormous ideas in concerning blogging.